The last item on the list is also the most interesting: Facts that are not subject to dispute. There are two different sources of indisputable facts. The first source is facts which aren’t subject to dispute because they’re generally known within the territorial jurisdiction of the court. For example, here in Orange County, Florida, everyone knows that Central Blvd. and Orange Ave. intersect in the middle of downtown. You wouldn’t need a geography expert to establish that fact — everyone in the jurisdiction is expected to know it, so you can ask the court to take judicial notice of the fact. The second source of indisputable facts are those which are capable of accurate and ready determination by resorting to sources whose accuracy cannot be questioned. For example, if you were trying to establish which day of the week August 3, 2007 fell on, your judge could take judicial notice that it fell on a Friday. Why? Because the fact isn’t subject to dispute — anyone with access to a calendar can quickly and easily determine its veracity. The great benefit of these forms of self-authenticating evidence is that you can introduce the items into evidence without the time and expense of calling a live witness to the stand. For example, I recently tried a case where my opponent was seeking to introduce a medical document. He didn’t use an expert witness or records custodian to admit the document. Instead, he introduced it using our state’s version of Federal Rule of Evidence 803(6). In case you’re unfamiliar with it, FRE 803(6) establishes another form of evidence that is (basically) self-authenticating: Records of Regularly Conducted Activity. When the evidence code was amended in 2000, they eased the business records hearsay exception by no longer requiring live testimony from a business records custodian. Instead, they now allow you to simply certify that the records are kept in the normal course of business. Using this evidentiary rule, my opponent didn’t need to call a single witness to the stand. Instead, he simply handed the document and the certification to the judge, then asked to have them admitted into evidence. That was it! Without asking a single question, he satisfied the entire evidentiary predicate for admitting the document. That was when I noticed the problem with “self-authenticating” documents. That’s what the document would have said, if it could speak. But it couldn’t. It just sat there while the juror stared at it. You could tell from the look on his face that he wasn’t sure what he was supposed to be looking at. He didn’t have any medical training, so medical codes and terms like “mg/dl” probably didn’t mean anything to him. He was just as confused as he would have been if the document had been written in Sanskrit. He stared at it for a moment longer, then passed it to the next juror. What might have been an important element in the case was completely overlooked, because the document didn’t get a chance to speak. 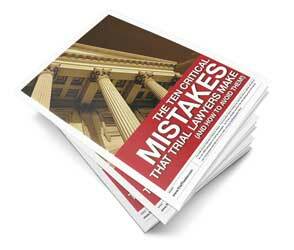 Many attorneys make the same mistake. They believe that if a document is self-authenticating, it should be able to “speak for itself.” But nothing could be further from the truth. Documents don’t speak. They don’t explain themselves. If a juror doesn’t know how to read them, or if they don’t know which parts of the document are important, the document just sits there and silently stares back at them. Don’t make the same mistake. As the trial lawyer, it’s your responsibility to ensure that the jury understands your evidence. Even when your evidence is supposed to “speak for itself,” you still must give it a voice. The most effective way you can help your self-authenticating evidence “speak” is by strategically publishing the exhibits to the jury. If my opponent had waited until closing argument to publish his exhibit, he could have shown the jurors which parts of the document to examine closely, and told them why it was important. Instead, they examined the document in a vacuum, and had no idea why it was important or why they were looking at it. The importance of the document was lost, never to be regained. Don’t fall into the trap of automatically publishing your exhibits immediately after they’ve been admitted into evidence. Wait until the most opportune time to publish them. This may mean that you don’t publish your self-authenticating documents until much later in your case, when a witness can use the document to explain or enhance his testimony. It may even mean that you wait all the way until closing argument (when you can explain the document or highlight the important elements) before publishing the documents to the jury. Self-authenticating documents don’t speak for themselves. It’s up to you to give them a voice. Find a way to work the document into another witness’s testimony, or hold off on publishing the document until closing argument. Regardless of which method you use, you’ll breathe more life into your evidence, making it more persuasive than it ever could be on its own. I’m waiting all the week to be Friday so I can read your tips, they are really good; I am José López, a young criminal lawyer in Mexico where the adversary system its beginning and many of your tips I had already applied them, and probably, I’m going to try to use many of them on my first degree murder trial to celebrate on September 8th! ; Of course that you will know the verdict. I would like you to write more about objections and cross examination, because as I said, in my country everything about this system it’s new and it will be helpful if you can share your knowledge and experiences. Thank you for your time and have a nice weekend. I enjoy receiving your trial tips. I miss having conversations with my professors while in law school. Trial Tips makes me feel like I am still getting some of the valuable feedback they provided. I find Trial Tips is a great resource. I review every tip and find them to be good refreshers; or a confirmation that I’m doing something right; or an idea that hadn’t occured to me before. How about do’s and don’ts regarding approaching officers and complaining witnesses before the docket call; I generally play it by ear. As a non attorney and non JD, I understand and enjoy your weekly newsletters.